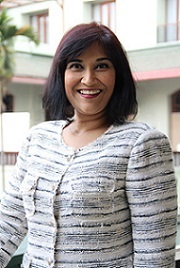 Yangon, March 2014: Chatrium Hotels & Residences has announced the appointment of Ms. Audra Rohini Arul as Director of Sales and Marketing of Chatrium Hotel Royal Lake Yangon; effective immediately. A native of Malaysia, she graduated from Centre International de Glion, Bulle, Switzerland in Hospitality Administration and also obtained a Diploma in Business Studies from Oxford Business School, United Kingdom. Prior to joining Chatrium Hotels & Residences, Audra previously held a position of Director of Sales and Marketing at Westin Siray Bay Resort and Spa, Phuket, Thailand. With a wealth of experience in the hotel industry, Audra began her career at Hyatt Regency Kota Kinabalu as a Corporate Trainee and was later promoted to Sales Manager. She also has experience from several other hotels including Marriott Kota Kinabalu, Sutera Harbour Resort, Nexus Resort in Borneo, Le Meridien Niwana Bali, Le Meridien Shimei Bay Hainan and Sheraton Hanoi. In this role, Audra will oversee the sales and marketing strategy and lead the team in order to successfully drive sales revenue and brand awareness. She will be based at the hotel property and will directly report to the General Manager. Join us in congratulating her and welcoming her to the Chatrium Hotels & Residences’ family. About Chatrium Hotels & Residences: The brand is born from a passion to provide a remarkable experience. Discover our 5-star services at properties located with comfort, convenience and captivating surroundings in mind, ranging from cosmopolitan city center living in Bangkok at Chatrium Hotel Riverside Bangkok, Emporium Suite by Chatrium, Chatrium Residence Sathon Bangkok, and Chatrium Residence Riverside Bangkok, to the relaxing beauty of Yangon at Chatrium Hotel Royal Lake Yangon. All are ideal whether for business or leisure travel, long or short stays.